Ryan Murphy is very busy making television, but somewhere along the line, he’s decided to try out social media. Back in August, he popped up on Twitter making casting announcements for Feud, and now, he’s appeared on Instagram, giving us some tantalizing — albeit very hard to parse — teases about some of his other projects. 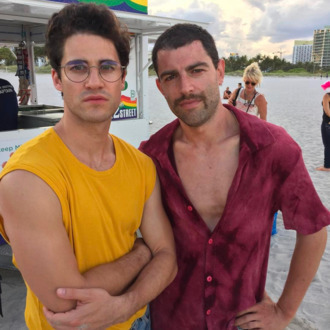 First up: a photo of Darren Criss, in character as Andrew Cunanan, in Versace: American Crime Story, alongside Max Greenfield. Greenfield’s casting hasn’t been formally announced, but going by his unbuttoned shirt, maddeningly asymmetrical mustache, and the fact that Murphy used the phrase “Do the Hustle” in the caption, we’re assuming Greenfield’s playing some sort of hustler. Another Murphy mystery: The producer shared a photo of a horrifying drawing of an elephant with an evil-clown-like smile, writing “American Horror Story Season 7 tease.” We know that American Horror Story season seven will be thematically inspired by the 2016 election, which leads us to guess that this is some sort of Republican monster, perhaps mixed with Twisty the Clown. Maybe that’s who Billy Eichner is playing. Ryan Murphy also shared a photo of his bedroom, which isn’t exactly entertainment news, but yes, in case you’re wondering, it does look nice.